Bixa orellana L. (annatto) is the unique exploited source for the production of bixin and norbixin natural dyes, which are widely used in the food, pharmaceutical, cosmetic, and textile industries. In tissue culture, adequate culture conditions are essential for the development of the plant. Among them, the saline composition of the culture medium and the type of explants are limiting factors. 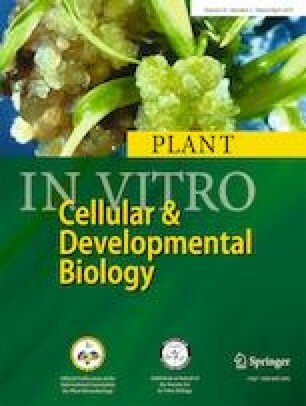 In this study, the effect of MS (Murashige and Skoog), Correia and colleagues (JADS) medium, Woody Plant Medium (WPM), and Driver Kuniyuki Walnut (DKW) culture media and wounding of hypocotyl explants on de novo shoot organogenesis (DNSO) of annatto were evaluated. It was demonstrated that JADS medium improved the nutritional status of shoots, which promoted the best development and quality of the plants generated after acclimatization, when compared to MS medium. The use of JADS medium for annatto DNSO during 45 d of culture was sufficient to regenerate and stimulate the growth of shoots, which had adequate elongation and rhizogenic responses. In addition, enlargement of the wound surface, using longitudinal sections of the hypocotyl explant cut surface down on JADS medium, significantly improved the frequency and number of newly formed shoots. This protocol enabled production of an average of 17 30-mm-long shoots per explant after 90 d of culture. These results will be useful for future studies related to annatto biotechnology. The online version of this article ( https://doi.org/10.1007/s11627-019-09978-2) contains supplementary material, which is available to authorized users. Chr. Hansen Ind. Com. Ltda. (Valinhos, SP, Brazil) for kindly donating the seeds of Bixa orellana ‘Piave Vermelha’, and the Laboratory of Plant Anatomy-Plant Biology Department/UFV for the facilities and support of the anatomical analyses. DFV, EMM, LNFC, and MVCS raised the in vitro plants for the experiments and performed the experiments; DSB, EMM, and DFV performed statistical analysis; and DFV, EMM, WCO, MGCC, LNFC, VBPN, MR, and AX contributed to the design and interpretation of the research and to the writing of the paper. Fundação de Amparo à Pesquisa do Estado de Minas Gerais (FAPEMIG, Grant number APQ-02372-17, Belo Horizonte, MG, Brazil), Coordenação de Aperfeiçoamento de Pessoal de Nível Superior-Brasil (CAPES)–Finance Code 001 (Brasília, DF, Brazil) and CNPq (Brasília, DF, Brazil) provided financial support.